It's a very nice sweatshirt!! GREAT product, I'm always happy with my orders ! I love it! And so do others. I've given your website to several people. The sweatshirt is soft, true to size, and the printing is perfect. 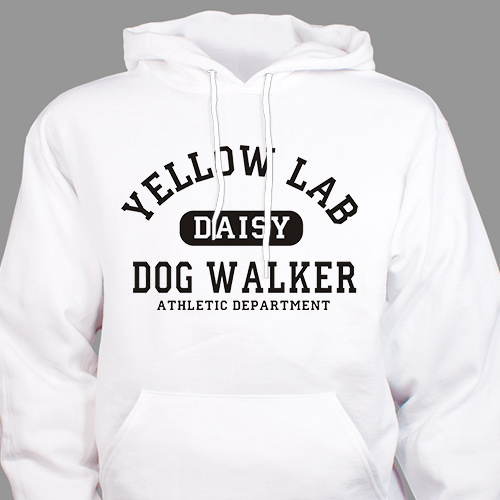 Additional Details This Personalized Dog Walker Hoodie makes a fun gift for any dog owner. Surprise your favorite dog walker with this hooded sweatshirt and be sure to also include our Engraved Dog Photo Cube & our Personalized Dog Frame as well. For all your Personalized Pet Lover Gifts, shop GiftsForYouNow.com.